Roll this word around in your mouth. Trill the “r” (there are two of them) and gargle the “ch”. Thanks to this word, Emmy and I are about to set off on a walking holiday in Scotland and England. (There must be a better word than “holiday” for the grim agony of long-distance walking.) Somehow, the resonance of Drumnadrochit has awakened a memory from a past life. There must be a gene somewhere inside me that has recorded a whisper of my Celtic heritage. Anyway, I want to go there and hear local people say “Drumnadrochit”. Drumnadrochit is a small village halfway along Loch Ness. We are scheduled to stay the night there on Tuesday, August 11th. And I’m going to report on it at length in this blog. We will be walking the length of Loch Ness – from Fort William in the west to Inverness in the east – in effect from one side of Scotland to the other. For me, the highlight will be Drumnadrochit. Before reaching this emotional summit, we will be exploring the foreign-language landscape of Glasgow (English is not spoken there, so they tell me). Then we do a combination railway and hiking trip up the west coast through Fort William as far as Mallaig, opposite the island of Skye. From Mallaig we’ll do a one-day excursion to Skye, then back to Fort William for the trans-Scotland trek. From Inverness we head down to Edinburgh by train for a few Festival events, then on to York and London also by train. After some shows in London and a day at the cricket (Australia tormenting the Poor Old Poms as usual) we’ll finish up with a nine-day ramble along the ancient pilgrim route through the North Downs from Rochester to Canterbury, then for good measure on to Dover. But since we are both now VERY OLD there are opportunities for the plan to come unstuck with every step we take. In fact it’s practically guaranteed to happen. So stick with this blog, dear reader. Sometime in the next six weeks you will be rewarded with a disaster. Disasters are so much more interesting (correction… enjoyable) than nice goals smoothly reached after careful planning. And this is what we are leaving behind. 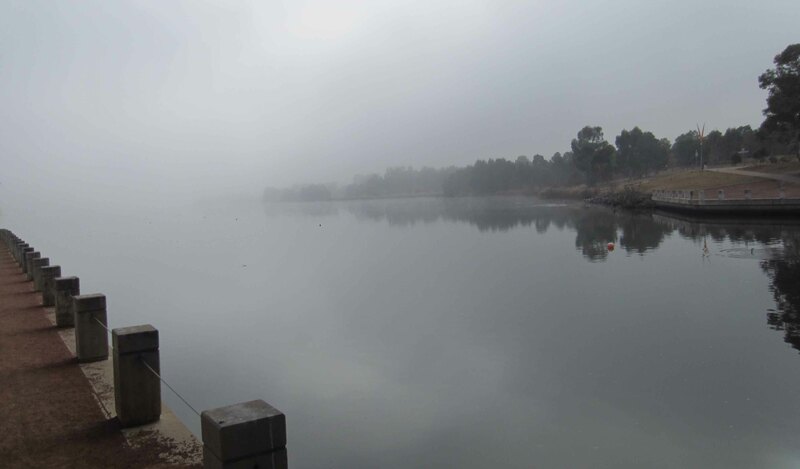 We are swapping Canberra’s wintery Lake Tuggeranong (below) for Loch Ness. You might ask “What’s the difference… the two lakes sorta look the same, don’t they?” Maybe, but being the capital city and seat of parliament Canberra has many, many more monsters than Loch Ness. Most of them are more funny than scary (though a few of them are genuinely scary), but unfortunately they live on the surface or splash around in the shallows. So we’re looking forward to Loch Ness for its silence and its depth. Say hi to Nessie for me please ! Will do, Lois. Hopefully Nessie will wave a flipper and say “hi” back.